Figure 2 shows the CLI classifications and heat units for southern Ontario. It is important to remember that prime agricultural lands, Classes 1, 2, and 3 and specialty croplands, are a very limited resource in Canada. Only 5% of the Canadian land mass is made up of prime land. Only 0.5% of it is Class 1. The Central Ontario Zone is fortunate to contain a significant portion of this very limited resource. Unfortunately, it occurs in one of the fastest-growing regions of the country. This conflict is easily explained. Ontario was initially an agrarian society. Settlement was most successful in good agricultural areas. The successful agricultural communities attracted service industries and the area grew. When development occurred, level farmland with good soils provided the best sites for development. The very resource that attracted settlement, is ultimately being consumed by it. As Figure 2 shows, the prime agricultural land in the Central Ontario Zone is located south of the Canadian Shield, along the Lake Ontario shoreline, and down into western Ontario. 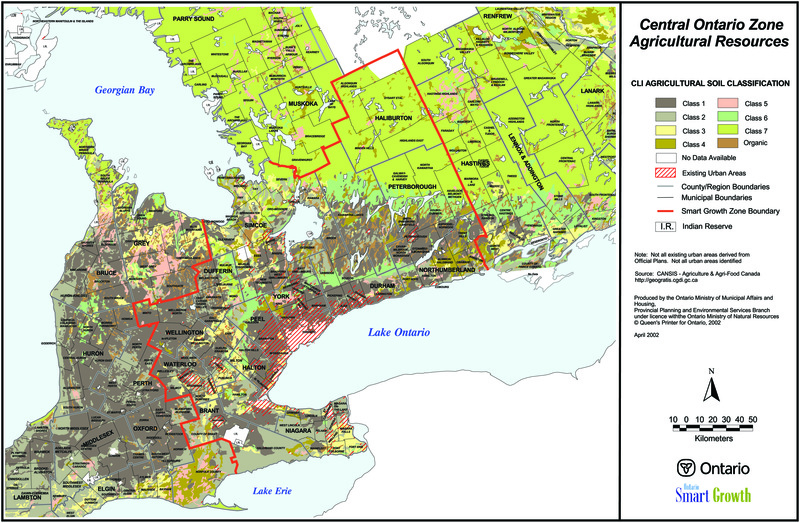 Soils analyses done for southern Ontario have confirmed that over 50% of the land in the central zone qualifies as prime agricultural land.5 Over 20 % of the land qualifies as Class 1. Figure 3 is a map of the soil classifications for the Central Ontario Zone with urban areas overlaid. The prime agricultural land is located where development pressures are greatest. The area around Kitchener-Waterloo, Hamilton, and the urban centres along Lake Ontario are almost exclusively Class 1 land. Urban development has spread along the shoreline of Lake Ontario in Niagara and Hamilton, where the tender fruit and grape lands are located. The Oak Ridges Moraine, which was recently assigned a higher level of protection, is not prime agricultural land. It appears on Figure 2 as the turquoise swath of Classes 5, 6, and 7 land. Identification of prime land on Figure 3 is based on the CLI. Other factors that elevate certain areas for production are not factored in. These factors include critical mass of agricultural operations and activities, access to services, markets and research facilities and skilled work force. Most of these attributes are also present in the zone and should be factored into a locational analysis. If this were done, it is likely that the presence of significant land would be even higher in the zone, making management of the resource an even more critical component of the Smart Growth strategy. 5. 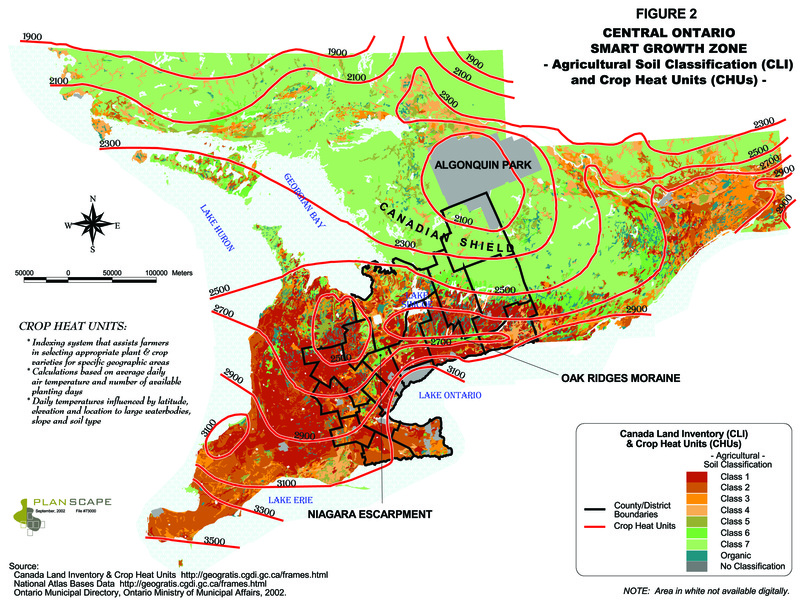 Douglas Hoffman, Acreages of Soil Capability Classes for Agriculture in Ontario, Report No. 8, University of Guelph, 1975.